In a rapidly growing multi-cultural city, Dublin comes into its own via its array of casual social spaces. For day birds, this is especially fortunate. Walking along the familiar route from Rathmines to Grafton street, by way of Portobello and Camden street, I took a moment to note a few examples of laid back Dublin. Wall and Keogh, with its fragrant teas in over-sized glass jars cannot help but slow your steps. In the world of teas, where sealed bags and limited aromas populate, the chance to try a variety of loose leaf teas, from the very sweet and fruity, to spiced concoctions, makes this little place interesting. Its cosy basement sofas and backyard gilt iron seating makes it ideal for the upcoming summer months. Sit with friends, sip hot drinks from mismatched crockery, embrace the cave-like ambiance. 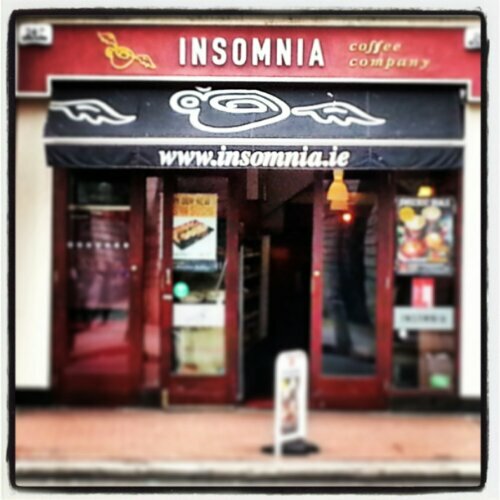 Coming up to the Insomnia cafe, with its dark roast double shot coffees, the name suddenly makes more sense. What makes this establishment all the more interesting is its free coffee grounds. Any one with a little garden, or indeed a big one, can find gratification in this city offering. Walking through St Stephen’s Green park on a cold spring day, Grafton street opens up to all lovers of shopping and life on luxury row. 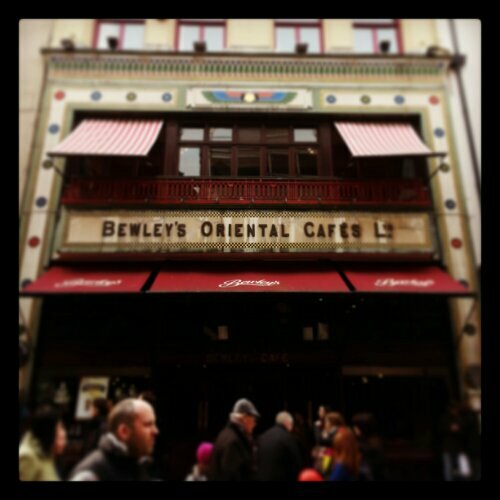 It does not take long before one is upon Bewley’s Oriental Cafes. With its restaurants on three levels, quirky, pretty and tiled facade, oil paintings of beautiful people and a roaring fire on cold days, this is indeed Dublin as is loved by locals and tourists. With gigs a regular feature above stairs, music is also a part of this beautiful establishment. With its reasonably priced menu filled with salads and good mains, Bewley’s is a lifestyle staple. I highly recommend the seafood chowder! 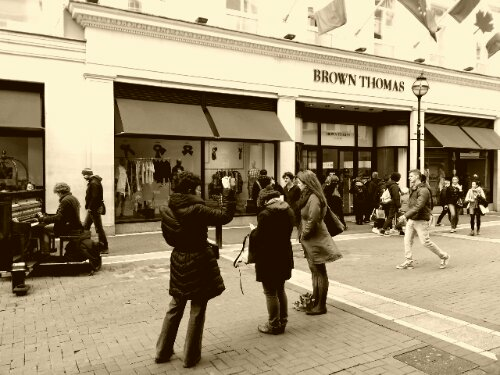 Brown Thomas comes at the end of Grafton street. The one stop place for lovers of luxury goods. If funds are limited, a stroll through the shoe department can prove adequate therapy. And if that does not fill your needs, a new oud perfume from Tom Ford can cheer you up. Maybe a new lipstick from Bobby Brown? Or just walk out with prettily colored macaroons from Laduree, sumptuous little gifts for yourself as well as all your girlfriends. Take a pause at Avoca. Walk in through the shop, swoon at all the colors from Irish and Scandinavian designers, pick up a book on fashion or cooking, or just some pretty damn good oat cookies. Then pop upstairs, past all the beautifully colored lambswool and cashmere throws, and relax at the restaurant upstairs. Order a fresh soup of the day, a carrot cake cupcake, or just a sweet scone with raspberry jam and clotted cream. Chase it down with coffee, then end your day in contentment. Then take the green line luas and head home. The day is done. It has been filled with beautiful and wonderfully colored specimens, of an eclectic and wonderfully varied city. 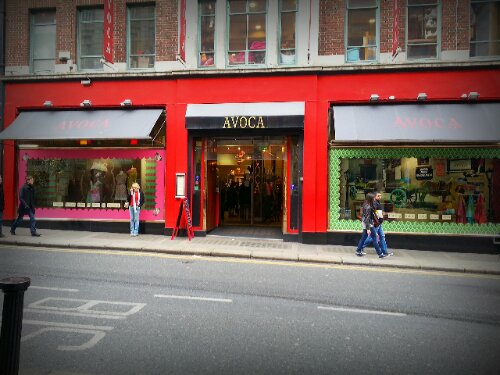 Posted on April 8, 2013 by Toy Ode	• This entry was posted in Articles and tagged Avoca, Bewley's Oriental Cafes, Bewleys, Bobby Brown, Brown Thomas, carrot cake, chowder, coffee grounds, Dublin, Dublin lifestyle, Grafton street, Insomnia, Oud, Oud perfume, Oudh, Portobello, Rathmines, St Stephens Green, Tom Ford, Wall and Keogh. Bookmark the permalink.